It's a bit early to proclaim a 2016 "The Year of" anything. But it's time. I feel confident knitting almost anything now. Even when I make a jillion dumb mistakes, I'm so just confident while I'm making them... unless it's socks. I've made three pair so far and it felt like I was holding my breath and cringing through the whole process. It was like riding through traffic with my husband behind the wheel. I suppose I'm not much of a sock knitter. I don't know how to tailor them to fit me. I have no preference as to which end I begin with, and I have no sock recipe. 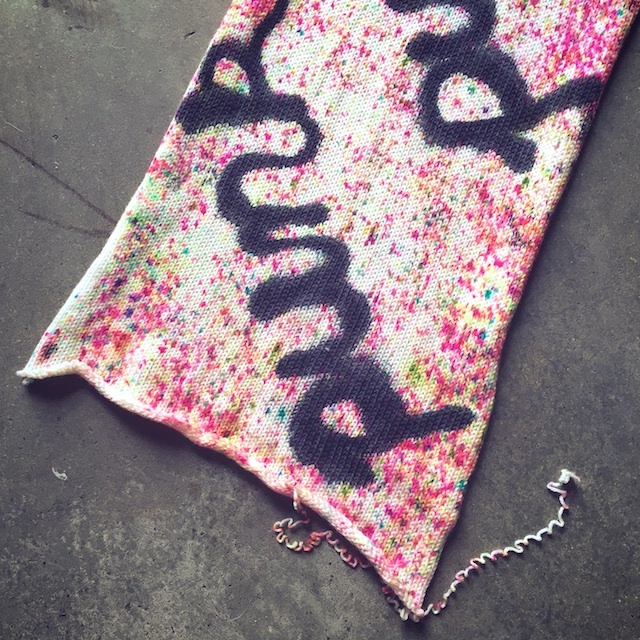 Like not being a shawl knitter, not being a sock knitter is a temporary state. I think most of us hold out for a few years, but after trying so many different things, it's the only challenge left. So you have to do it. It's also hard to be part of the knitting community and not become intrigued by all of these rabid knitters stalking the Arne and Carlos Design Line and instagramming Rose City Rollers. It's completely peer pressure. You guys made me do it. 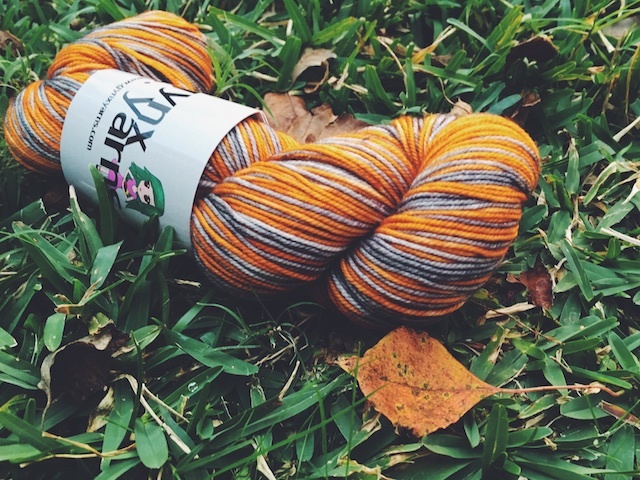 So, though I'd like to say I'm wanting to be a sock knitter because it's the most practical knit in Texas and everyone wears them, it's really because I like the bright, shiny things I see online. 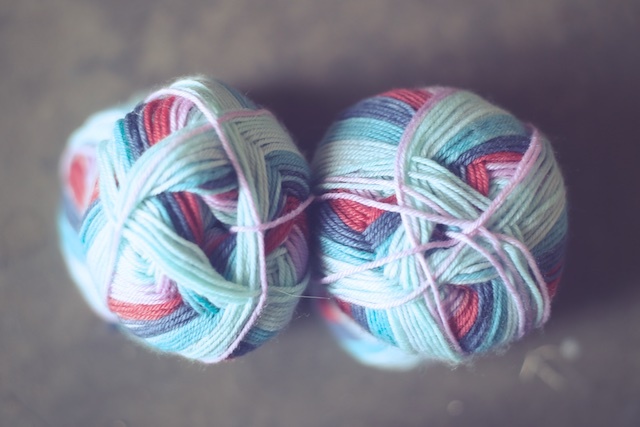 I want to knit something that self-stripes, besides mittens, and I want to buy pretty yarn in little, affordable batches. Like knitting shawls, socks let me indulge a little. 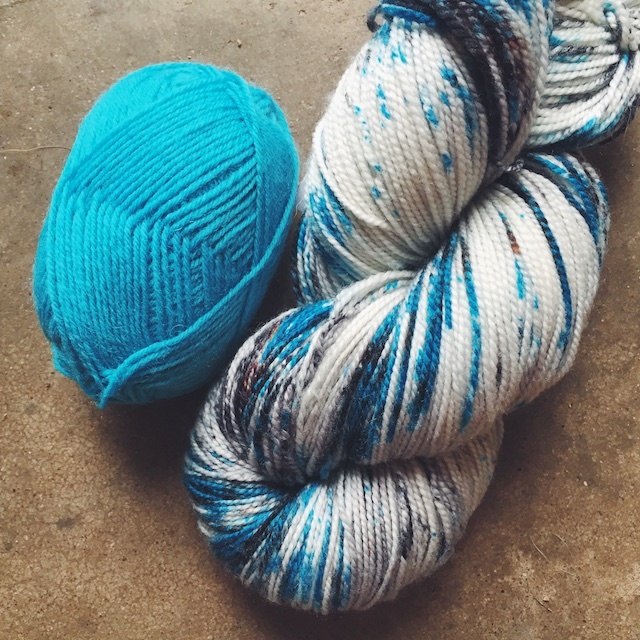 In anticipation of my future as a sock knitter, I bought this Graynbow colorway and Gym Class (above) from Gynx Yarns. I also stocked up on some Felici. At this point, I probably have enough dedicated sock yarn for 11 pairs of socks. 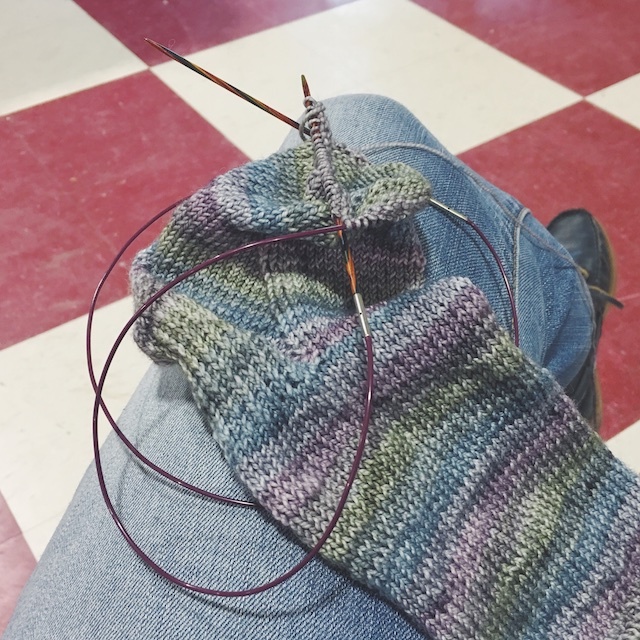 There's yarn for several self- striping pairs, contrast heels and toes, and a couple of speckled ones, a sock blank, and even a cotton/nylon blend for summer socks. I can also attest to the portability aspect of socks on magic loop. Much of this sock was knit working a firework stand fundraiser for the youth of my church. I could throw it in my pack anytime a customer walked through the door. 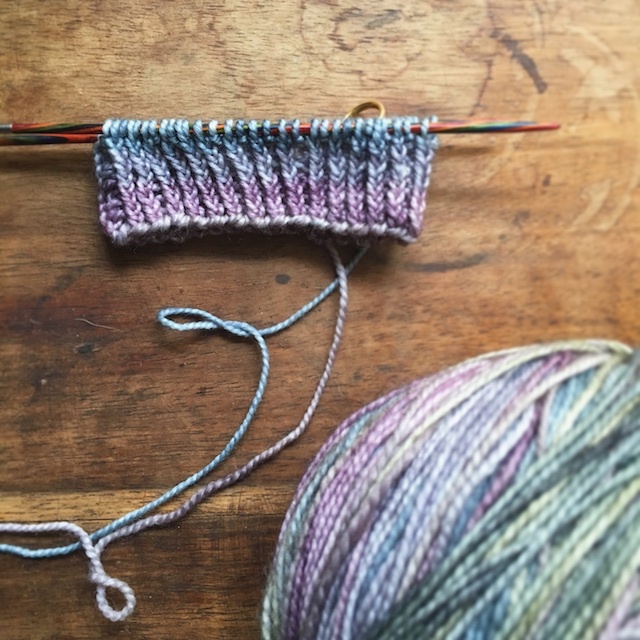 So, now that I've decided to make socks my tv knitting project of choice this year, I needed a nudge to cast on. That encouragement came from Dani, of the Little Bobbins Knits podcast, with her Christmas Eve Cast On. I didn't get to cast on that night, but I did dive into my yarn and resurface, eventually, with the Graynbow yarn and unoccupied needles. When I did finally post my WIP to the thread, I was amazed at how that thread had already exploded with works-in-progress photos. Dani throws a good party. In there, among all of the pros who churn out a sock a day, there are a few knitters who are like me: recipe-less. 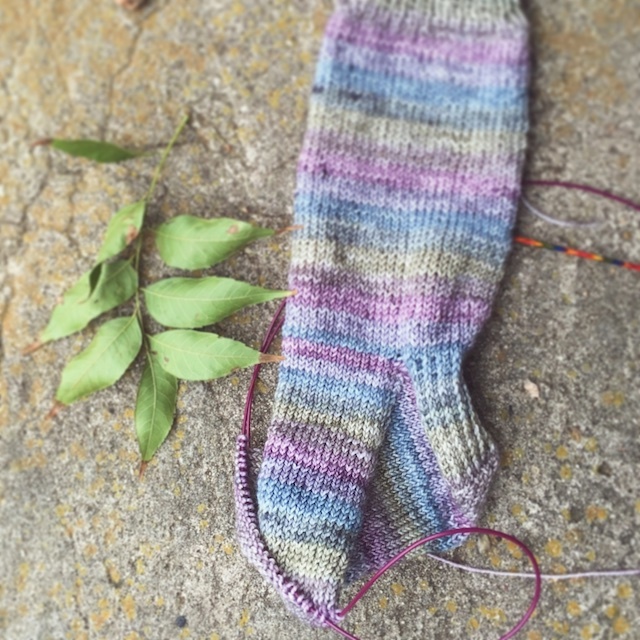 I'm using the Favorite Socks pattern from Kristin, of Voolenvine. This pattern is a cuff down version, which is fine with me. I've done two pairs cuff-down and one toe-up in the past and have had mixed results either way. The knee socks (one cuff-down, one toe-up) fit great in the foot, but have loose cuffs. My Hermione's Everyday socks, which were cuff down, were fun to knit, but the first attempt was too big. The second attempt was better, but still more like a cabin sock than a regular sock...and now they are lost in the black hole of my dresser. I'm working on the foot now and have only had one hurdle: picking a cast on number. I have a women's size US 8 foot, yet the medium sock cast on, of 64 stitches, was too big for me. I'm sure I'm not knitting as tightly as the average person, but I cannot get it tighter. I'm already using bamboo needles and size 1s, I don't want to use 0s. So I've learned that my foot is narrow enough for a small cast on, while being a medium in length. The cast on of 56 stitches seems perfect. I'm using continental knitting as much as possible to keep the knitted fabric nice and tight. Some of the patterns I'd like to knit this year are Climb, SpringTastic Socks, Flying North, Susan B. Anderson's How I Make My Socks, Business Casual, Hex Mesh Socks have been in my queue forever, Bickersstraat, Rose City Rollers, some Hiking Socks, Fika, and Flying Geese socks like Dani's. Any tips, friends? What patterns would you guys recommend to a sort-of- beginner? Any favorite heel, cast on methods, etc?